Rick’s Rich Ragu with Wild Mushrooms over Homemade Tagliatelle | When I Survey . . . 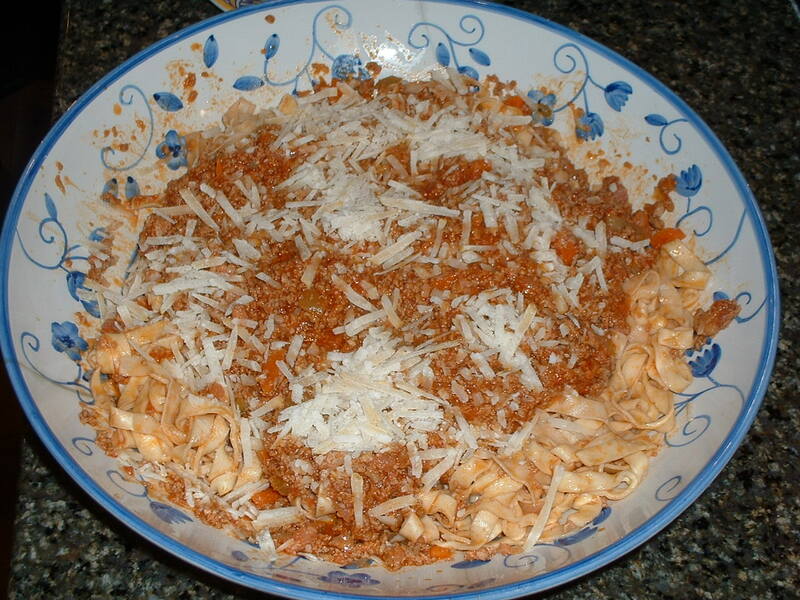 This rich meat ragu is my nod to a traditional Bolognese sauce. The wild mushrooms add a wonderful earthiness to it. OK, so I’m showing off just a little here with the homemade pasta, but you really don’t have to serve this sauce over fresh pasta. It is equally delicious over dried pasta such as Rigitoni or Penne. But if you are going to work all day on the sauce, use good quality imported dried pasta like De Cecco. But if you have the time, homemade pasta is a wonderful thing, and it’s not really hard to make, but, trust me on this, it does take time. When my children were little, and my wife, Martha, who is a nurse, had to work at night, I would muster my little force and the kids would “help” me make fresh pasta. It kept them busy for hours, and at the end of the process we had lovely Tagliatelle hanging from all kinds of drying racks and everybody (and the kitchen) was covered with flour, and Mom didn’t even have to see it. I have made this pasta several ways: with just a rolling pin and a sharp chef’s knife, with the pasta extruder on my Kitchen-Aid mixer, and with a stainless steel hand-cranked pasta machine. I like the latter best myself. I bought mine at the First Church tag sale many years ago, and it has made a lot of pasta at the Floyd household. So if you have the better part of a day to hang out in the kitchen this can be a great project on a cold day. Your simmering sauce will fill the house with lovely aromas. And the ragu itself isn’t very hard to put together, although it takes a certain vigilance over many hours. But the nice thing about it is that during that time you can make the pasta, and at the end of the day you will have a lovely comfort food dinner that will delight everyone at the table. The pancetta is hard to cut fine enough by hand, so I cut it into small chunks and finish it in the food processor with the onions, carrots, and celery, and that keeps it from sticking to the blade. Cover the porcini mushrooms with hot water and let sit while you do the next stages. Heat oil and butter in a large heavy-bottomed skillet or casserole, and when the butter foams add the pancetta, onion, carrot and celery and sauté over medium high heat until it takes on some color and is beginning to brown. Turn the heat down to medium and add the beef. Cook, breaking up the pieces and stirring, until the pink goes out of the beef, but don’t brown it. Add the white wine, turn the heat back up a bit, and let all the wine evaporate, stirring now and again. Turn the heat back down to medium and add the milk and nutmeg, and cook until the milk evaporates, stirring from time to time. Add the tomatoes, squeezing them between your fingers into the pan. Pour the mushrooms through a sieve lined with cheesecloth (or a coffee filter) into a bowl and retain the liquid. Chop the mushrooms coarsely and add to the pot along with their liquid. Bring it all to a very gentle simmer, partially cover, and literally put it on a back burner for as many hours as you can, stirring from time to time and watching your heat so it doesn’t start boiling. If you are gentle with this sauce it will reward you. How long? The one I made yesterday had at least six hours, but I would say at least three. It should reduce into a thick rich sauce. Taste and adjust for salt and pepper. When you are ready to serve it, toss your pasta with just enough of the sauce to moisten it (it’s really rich) and serve bowls of sauce along with it so people can add more if they choose. Top each plate with freshly grated Parmegianno-Reggiano cheese and you’ve got a little bit of heaven on a plate. A salad and some crusty bread will round out this meal. For wine, a good Tuscan red or a Nebbiola-based wine will make you smile. Do not be afraid to try this. The dough for this pasta has only two ingredients, flour and eggs. Some people are dogmatic about using pasta flour, but I just use King Arthur All-purpose Flour and extra-large eggs. For six servings I use three cups of flour and four eggs. Put your flour on a clean counter or pastry board and make a well with it. Then break the eggs into the center of the well (see photo below) and with a fork beat them, while drawing small amounts of flour from the edge of the well. Don’t be impatient; you can do this! Just keep beating the eggs and drawing flour into them until you have a nice soft dough. Put the dough aside and scrape off your board. Put flour on your hands and on the board and knead your dough for about 10 to 15 minutes. Add extra dough a little at a time until the dough is soft and pliable. When you stick a finger in the dough it shouldn’t be wet, but not too dry. You’ll know. It is now ready for the pasta machine. The pasta machine has two parts, a set of rollers that rolls the dough, and the actual blades that cut the pasta into ribbons. Set the rollers on your machine for the widest width. Cut a piece about the size of a large egg, and put the rest under a towel so it won’t dry out. Run the piece through the rollers 6 or 8 times until the dough is smooth and isn’t sticky. Adjust the roller to the next smallest setting and repeat the process. Keep adjusting the rollers smaller until you get the dough to about 1/16 of an inch, then put it through the cutting blades and make your ribbons of Tagliatelle. You can put the pasta on a rack, or nest it into a small bundle (see photo below). Then start again with another piece and follow the above procedures until you have made pasta from all the dough. This takes some time, but is strangely calming. When you are ready to cook the pasta, bring a good-sized pot of water to a boil and cook pasta for only about three minutes, then sauce with the ragu. Yum. This is why my kids call me the “Pasta Emeritus!” Enjoy.